This item is currently out of stock and is not available. 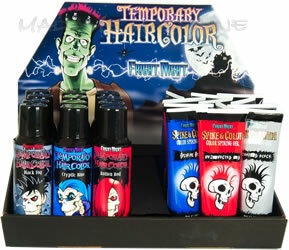 Fright Night Streaks 'N Tips and Spike & Color Display comes with 24 pc of temporary hair dye (12 sprays and 12 gel with a stand up display to please every Witch and Goblin. Streaks 'N Tips and Spike & Color Display is easy to spray-on and shampoo out. This display is perfect for salon or retail shelf to catch the customer's attention.